Hi Guys, most of the time someone blocked you on WhatsApp, but there is no way to check about who will blocked you WhatsApp. But now, you want to know how to check someone blocked you on WhatsApp. At present lot of time spend his time on WhatsApp. There are billion of users around the world who daily use WhatsApp on his smartphone. Today we discuss how to check someone blocked you on WhatsApp. There are lot of reasons due to which someone blocked you on WhatsApp. If someone don’t want to chat you more, if you misbehave to other person, if you send double meaning messages, audio, video, images via WhatsApp or many more things. Due to which someone blocked you on WhatsApp. There is no way how to know someone blocked you on WhatsApp, but after reading this article you will be able to know that. If someone blocked you on WhatsApp and you want to know about that then you must read few given important things. These things helps you get the answer of your question. This is an important way to know someone blocked you on WhatsApp or not. If someone blocked you on WhatsApp then you just check there is no profile picture will be seen on your WhatsApp. When another person unblock you then you will be able to view his profile picture. This is another ways to known someone blocked you on WhatsApp or not. If someone blocked you on WhatsApp before few days or months, then you will see his profile picture is changed on other person smartphone. But you will not be able to view his profile pic bcz he already blocked you on WhatsApp. If you check, then put his mobile number in any other smartphone you will see his profile picture on other smartphone or you can also change your sim to check it. After doing this you will be confirmed that person blocked you WhatsApp. This is another way to check someone blocked you on WhatsApp. Normally last seen date will be changed day to day. But if someone blocked you on WhatsApp then you will check the last connection date. This last connection date may be before few days or month. That will be sure that he will blocked you on the WhatsApp. We know that you can easily send any text, audio, video message via WhatsApp to other person. When he will check you message on WhatsApp, it will shown double checked sign on your WhatsApp window. But if someone blocked you on WhatsApp then you will not able to view double check symbols. There is no way to shown double check sign without reading the message on WhatsApp. Most of the person dislike to talk to other person,that’s why they blocked someone on WhatsApp. We know very well each and everybody set his profile pic and status on WhatsApp. If someone blocked you on WhatsApp then you will not be able to check other person status who blocked you. This is another important way from which you will be able to check someone blocked you on WhatsApp or not. 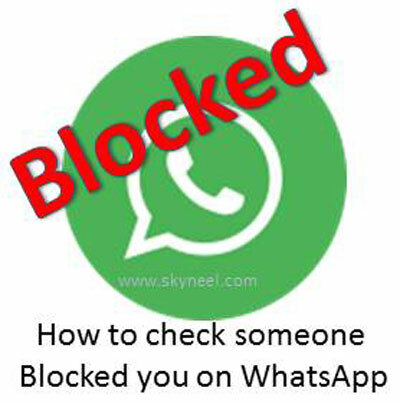 I hope you like this How to check someone blocked you on WhatsApp guide. There are billion of users who daily use WhatsApp on his smartphone. They want to know who blocked them on WhatsApp, then you must read this article. After reading this article you will be able to easily check someone blocked you on WhatsApp or not. Kindly share your knowledge and this article with others to help them and give your important suggestions in the comment box. Thanks to all.